Kia's 2016 Soul compact wagon is truly one of a kind. With an expressive exterior and feature-rich interior, the little Soul delivers an impressive dose of cool for not much more than an average compact car costs. Kia's 5-passenger wagon is great for kids, couples or empty-nesters and even offers an environmentally friendly electric model. Kia Soul relatively trouble free but has a few design flaws. The vehicle is comfortable to ride in for up to 4 people. Storage area is average for a small vehicle. It does not get great gas mileage. For a car this small, it should get much way better gas mileage. Stats say 31 hwy 24 city but I think it gets less than that. I'm forever filling up my gas tank. Next car I get will be more fuel efficient. Another problem I have is the seat-belt design. It's easy to get it twisted and very hard to untwist if the belt in the holder mechanism gets twisted. They need to work on the seat-belt design. I also rented a Kia Forte which had the same bad design and I could not get the seat belt untwisted to put it on. This creates a dangerous situation. Another issue with the Kia Soul is the electronic tire warning is always lighting up whenever there is a change in the temperature. I have to double check to make sure I don't actually have a flat tire. The mechanism is too sensitive and turns on way too frequently when it isn't necessary. I would like more cup storage between the driver and passenger side. I like the lighted glove box. I also like the mood lighting options in the door as well as the full-size back up camera. The car came with a lot of extras which I did appreciate. I really wish they would bring back the inclusion of a cd player. I get tired of listening to the radio and don't feel I should have to pay extra to buy a separate system for my car when I've already spent a lot of money for a new vehicle. The floor mats are another problem as they can be difficult to remove and put back in. Overall, the car has been low-maintenance and trouble free. Loving my new little SUV!! I purchased the Soul because I was looking for a small SUV type of car. It is exactly the size I was looking for. I feel much more safe on the interstate because I sit higher than my other car and feel that the car is better built. The interior space is perfect for me. I am in my car a lot and transfer things for work and personal use and the folding back seats are perfect. I even moved my daughter to and from college with no problem. The car gets fairly good gas mileage, I do wish that was a little better and I wish the gas tank were larger. I do feel that I am constantly putting gas in the car. I love all of the simple bells and whistles. I do wish that it had a CD player - probably an option that I could have gotten if I had thought about it at the time. Perky roomy great priced car. 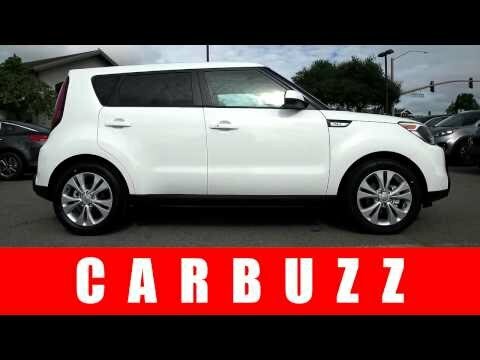 The Kia Soul is a perky vehicle to drive! It gets great gas mileage. It is very roomy inside... My boyfriend is 6'3" and his head does not hit the ceiling like it did in other cars... The sound system has great base. It feels like a smaller SUV but still roomy inside. The price is also great! This is my second Kia Soul, my first was 2013. I searched for the lowest priced new car and the Soul popped up. I test drove, fell in love and bought it. The only thing I do not like about the base model is there is no key fob and no key lock on the rear hatch so if you are removing anything from the back you have to open the back then return to the front to lock the car then return to the back to retrieve your items. Kia Motors America (Kia) is recalling certain 2014-2016 Soul and Soul EV vehicles. The pinion plug may allow the pinion gear to separate from the steering gear assembly. If the pinion gear separates, steering will be lost, increasing the risk of a crash. Kia will notify owners, and dealers will inspect and secure the pinion plug or replace the steering gear assembly, as necessary, free of charge. The recall began November 16, 2017. Owners may contact Kia customer service at 1-800-333-4542. Kia's number for this recall is SC155. Note: This recall supersedes campaigns 14V-332 and 15V-736. Vehicles previously remedied under those numbers are being recalled again under this campaign.